Benefits Of Citrus/ Lemon Fragrance! The versatility of Lemon is no doubt amazing! A product that can be used as a beauty treatment, cleaning agent and lets not forget the aromatherapy values of lemon. One of my favorite things about the lemon is the scent. Laguna Candles signature scent is " Laguna Paradise." It is our number one selling soy blend scented candle. It is comprised of lemon, citrus lime and verbena. Our Private Label Candles has this amazing fragrance. People often overlook the importance of fragrances for the fullness of experience. That mistake can be fixed by letting the scent of Laguna Paradise fulfill your personal space. Laguna Candles offers a wide variety of memorable aromas to tell the story about the infinite beauty of our planet. Our Private Label Candles are made of domestically grown sustainable soybeans, Laguna Candles ensures the cleanest possible burning, while providing room-filling, yet not overpowering flavor. Give The Gift They Will Never Forget! 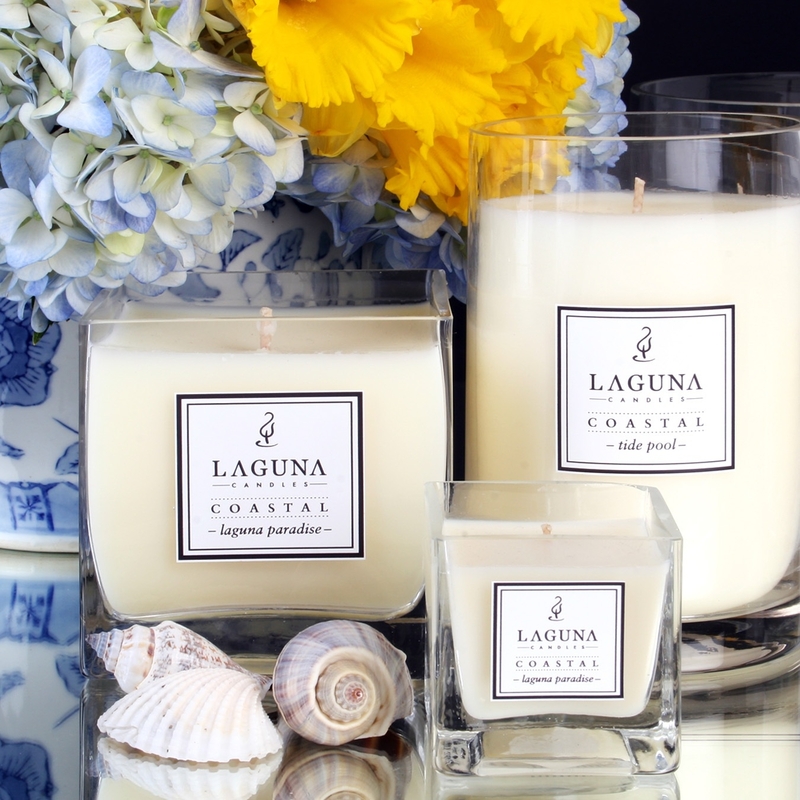 Laguna Candles, maker of luxury scented candles, hand-poured in recycled glass candle jars and hand blown, artisan glass containers was founded on the desire to offer a collection of the finest Fragrant Candles. Our Heirloom Artisan Candles are comprised of our proprietary blend of coconut and soy wax, unbleached cotton wicks and the best natural extracts and essential oils. We create sublime fragrances for any interior space. Even as we expand globally, we are committed to maintaining our local presence, and reinvesting in the beautiful community that makes our success here in the states possible. In addition to creating jobs for local residents, we cultivate partnerships with local businesses and work with organizations to promote economic growth here in the United States. As you shop for home, office, spa, unique personal gifts, unique corporate gifts, promotional corporate gifts or custom corporate gifts we're certain that you will find unbelievable value, luxury & uncommon function. Best Candle Scents For Fall! It just wouldn't be fall without the warm and pungent scent of spices. Cinnamon, clove buds, and Canadian fir tree are scents synonymous with the chilly season that are guaranteed to make your home smell like fall. In our Gilded Spices Candle, they're introduced by a zesty verbena accord that eventually vanishes into an intense base of golden pomander and warm musk. It's the perfect way to kick start the season on the right foot. One of the most interesting perfume ingredients, iris is anything but ordinary. Woodsy and airy, light and earthy, iris has a tender floral aroma that never crosses into full flowery territory. Iris tames the intensity of warm and creamy woods, such as French wood, and adds creaminess and smoothness to the sharper aroma of lavender. Blended together in our Spa Iris Candle, these notes create the perfect cozy atmosphere for a relaxing fall afternoon. Fall calls for the soft and inviting embrace of a luxurious cashmere sweater to keep you warm during those crisp short days and chilly longer nights. Our Golden Teak wood is a like a creamy cashmere sweater but in candle form. Its warm heart of soft cashmere, golden amber and Spanish sage is both soft and comforting and leads to the sensual embrace of the smooth musky vanilla base. Its sparkling verbena opening is a delightful surprise for the nose too. 'Tis the season to pick apples and red currents and turn them into delicious homemade pies. We've added a twist to the recipe and used their mouthwatering crispness to introduce a succulent blend of agave and water lily that eventually melts into a sensual accord of blonde woods enriched by the warmth of musk and the earthiness of oak moss. The Succulent Agave And Oak moss candle is just guaranteed to make you fall in love with the season all over again. Not ready to say goodbye to summer just yet? Our Beach Driftwood candle is just the right scent you need to make a smooth transition from carefree summer to chilly autumn. It hits all the warm and cozy notes, from earthy green leaves to heady jasmine and dry exotic woods, but spices them up with a spritz of salty ocean air to take you back to those lazy days spent relaxing at the beach. The best of both worlds! Five reasons why I buy local! What an honor it was to be featured in the March issue of Orange Coast Magazine a few years ago. There are times when I felt that our family owned business would not seen by the many. When we received that call from one of the editors from Orange Coast Magazine, we were honored. Now let's address the Benefits Of Buying Local! 1. It helps create jobs: One of the reasons why I hire local artisans to make our Heirloom Artisan Candles is simply because I sincerely want to do my part to support local artist in my community here in Laguna. Small are the largest employers nationally and within our community. 2. You get get better as well as personable service: Here at Laguna Candles we stand behind our product 100%. If you are not happy return it! Local business often hire people with a better understanding of their product. 3.It reduces Environmental Impact: Locally owned business can make more local purchases requiring less transportation. Which ultimately contributes to less congestion and pollution. 4. It allows you to invest in your community: Local businesses are owned by people who live in the community! Local businesses are less likely to leave and more invested in the community's future. We have so created many private label candles for other companies. 5. It gives the local business the opportunity to support themselves and the community: Several studies have shown that when you buy from an independent, locally owned business, rather than a nationally owned businesses, significantly more of your money is used to make purchases from other local businesses, service providers and farms -- continuing to strengthen the economic base of the community. I hope you have a willingness to get to know our brand, and I would love to get to know and support yours! What is scent marketing and how it can benefit your business.